The 2020 Toyota Highlander is clearly trying hard to look tough, but, whatever. The design is inoffensive. What’s cool about this car is its efficiency, in a couple senses of the word–the Hybrid version now claims 34 mpg(!) in combined driving. That’s not a lot of gasoline to lug eight people around. The outgoing Highlander Hybrid hit 28 mpg in combined highway and city driving, making the 2020 model a pretty significant step upward in fuel economy. Highlanders have three rows of seating and while lower-trim variants seat eight with a middle bench, the nicer ones will have captain’s chairs for a little more comfort at the cost of one seat. The new Highlander can stash 16.1 cubic feet of whatever behind the third row, and its cargo capacity expands to 73.3 cubic feet if you fold all the back seats down according to the preliminary spec sheet. The standard 3.5-liter Dual VVT-i V6 engine, which turns out a factory-stated 295 horsepower and 263 lb.-ft. of torque, claims 22 mpg in combined driving but will feel a little swifter than the electric-assisted model. The Hybrid, which is clearly the spec to get, is propelled by a 2.5-liter DOHC VVT-i four-cylinder engine paired with two electric motors making a reported 240 total HP. Either powertrain can be ordered with front or all-wheel drive. But if you want to use your Highlander to tow things, you’re going to want the V6, which can have a towing package that includes a heavy-duty radiator, engine oil cooler and improved fan to be able to pull 5,000 pounds. 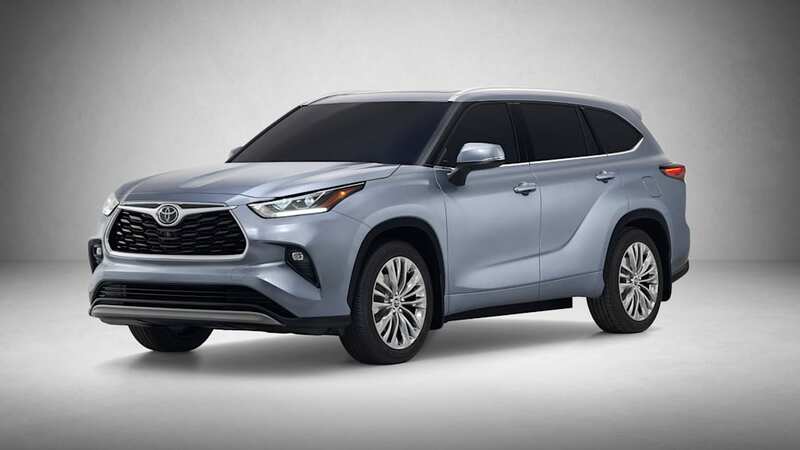 As far as convenience tech, a suite of safety tools like pre-collision warnings, automatic high beams, radar cruise control, and something new for the Highlander called Lane Tracing Assist which is Toyota’s name for lane-keeping. The Platinum trim, which is the finest finery a Highlander can be kitted out with, will have an expansive 12.3-inch touchscreen for infotainment functions, finally taking Toyota out of the in-car display stone ages I hope. Lesser Highlanders (there can not, contrary to popular belief, Only Be One,) get eight-inch screens. 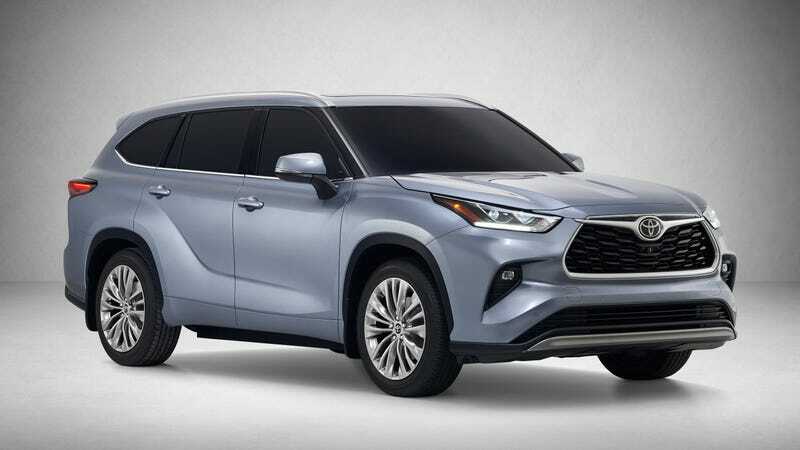 I’m pretty tepid on the new 2020 Highlander’s looks. It seems like it’s caught in an awkward adolescent stage somewhere on a transition from “truck” to “station wagon,” but I’m excited at the idea of a large seven or eight-passenger car hanging out with mpgs in the mid-30s. If parents are going to keep insisting on getting substantial SUVs and crossovers for their families’ convenience, at least their fuel consumption and driving costs can be curtailed a bit. We have yet to drive the 2020 Highlander, but will update this post when we do. In the meantime, you can find everything we know so far about it below. What's new for 2020? What's the Highlander's interior and in-car technology like? The 2020 Highlander interior largely maintains the functionality of its predecessor, but makes it more visually distinctive. Materials quality has also been improved, with more stitched simulated leather surfaces, but to be fair we've only seen the range-topping Platinum trim at this point. 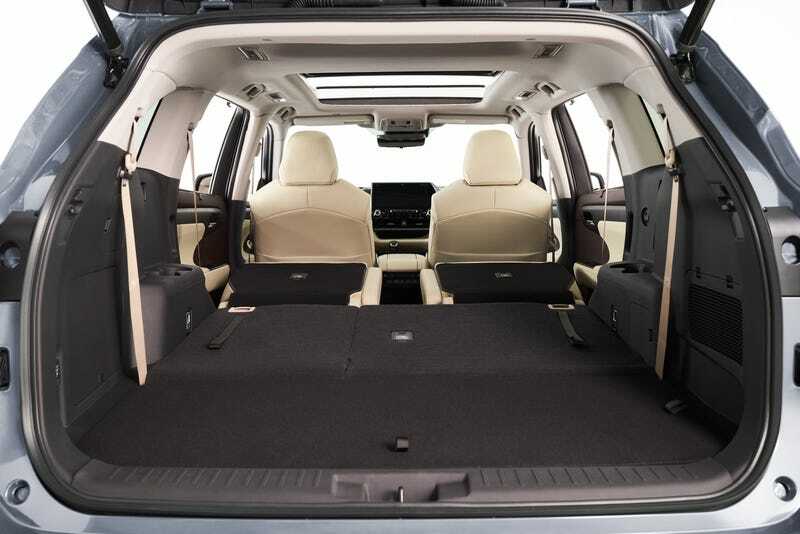 Interior storage remains a priority for Highlander. It retains the mid-dash shelf of its predecessor, but it's now split in two (one beneath the center stack controls, the other in front of the passenger), and there's a squishier, grippier surface inside to keep items secure. Below, there's a larger area specifically devoted to even the biggest smartphones. It is there where all three front USB ports reside, while those in the rear are on the back side of the center console (there are none in the third row). That center console's bin is once again very deep and covered by a sliding cover **— but there's only one cover now instead of the old model's odd clamshell design, and it's more densely padded to better serve as an armrest. In terms of technology, every 2020 Highlander comes standard with Apple CarPlay, Android Auto, Amazon Alexa integration, Waze app control, satellite radio and in-car WiFi. All trim levels but the top Platinum also come standard with an eight-inch touchscreen, which is currently the optional screen size on most Toyotas. It's also mounted quite high on the dash, making it easy to see (and effectively larger, like sitting closer to your TV). The Platinum has a 12.3-inch screen, which is a Toyota first. Like other extra-wide screens, such as the one in the Kia Telluride, it allows for a 60/40 information split. You can simultaneously look at hybrid information and the Apple CarPlay interface, for instance, which eliminates the need to constantly go between screens. If you're shopping within the Toyota family, the Highlander offers appreciably more space than the RAV4, both in terms of cargo capacity and its extra row of seats. It also has a deeper, more accessible space than what's in the 4Runner. That said, the Highlander is one of the smallest three-row crossovers available. Apart from the Kia Sorento and maybe the Mazda CX-9, you're going to find more cargo capacity and passenger space in the Highlander's competitors. That's especially true in the third row. The second row slides a bit more to grant extra legroom now, but the third row remains awfully close to the floor, and it won't be long before your growing kids will feel cramped and claustrophobic in the way-back. Full-size teens and adults will be flat-out grumpy. That said, the Highlander's smaller size might be just right for many buyers who appreciate its more manageable dimensions when parking or maneuvering in tight spots. Plus, if you only need that third row for occasional use and just a little more space than what a RAV4 provides, it really won't matter that the Highlander can't match its competitors' jumbo size. What's Highlander's performance and fuel economy? 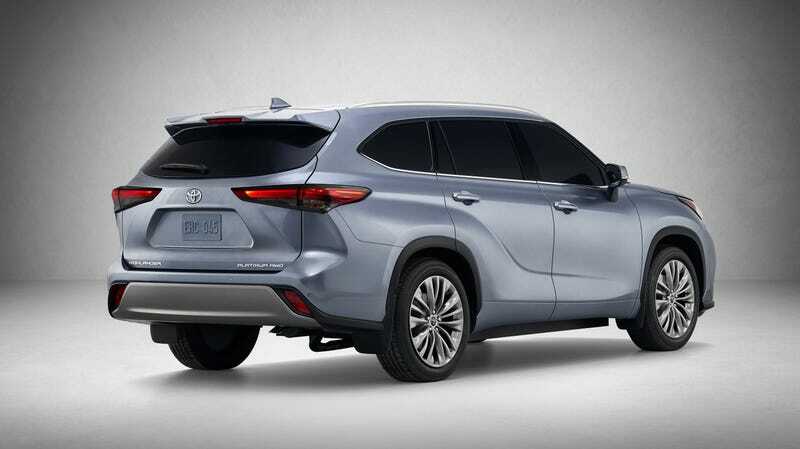 There are two powertrain available for the 2020 Toyota Highlander. The standard, gas-only engine is a 3.5-liter V6 that produces 295 horsepower and 263 pound-feet of torque. That's one of the greatest standard outputs in the segment, bettered only by the 2020 Ford Explorer and Chevrolet Traverse. Full EPA fuel economy estimates have not been announced, but Toyota says it expects an estimate of 22 mpg combined for front-wheel-drive models. An eight-speed automatic is standard, but like the new RAV4, there are two available all-wheel drive systems. The base one available on L, LE and XLE is a typical reactive system that operates in front-wheel drive until slippage is detected, in which case, power is sent to the rear axle. The Limited and Platinum get the new Dynamic Torque Vectoring all-wheel drive. It's a predictive system that draws data from multiple vehicle controls to determine whether power is needed at the rear. It can also send different amounts of power between the left and right rear wheels, hence the torque vectoring bit in its name, to aid dry road handling as well as wet weather traction. There's also its Rear Driveline Disconnect system that disengages the prop shaft in certain cruising situations to save fuel. That's also accomplished with a new standard automatic stop/start system fitted to all 2020 Highlanders. 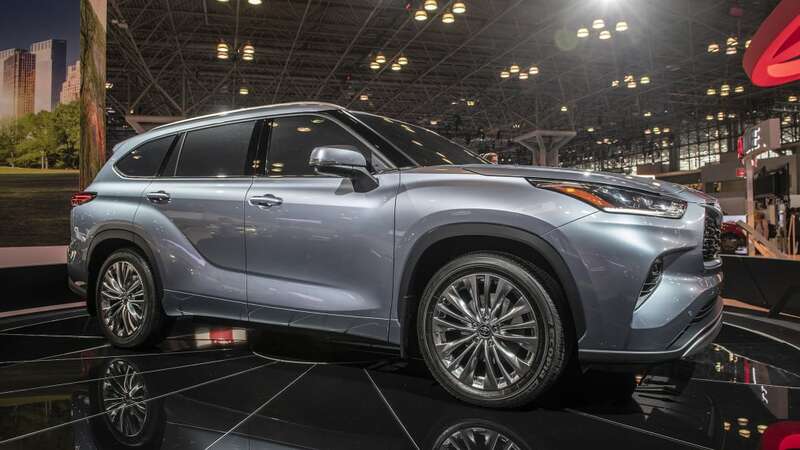 The 2020 Toyota Highlander Hybrid features a 2.5-liter four-cylinder that teams with a pair of electric motors to generate electricity and power the front wheels. All-wheel-drive Highlander Hybrids gain a third motor at the rear axle. Total system output is 240 horsepower (same as the Avalon and more than the RAV4), while Toyota estimates it will achieve 33-34 mpg combined. That's up from 28 mpg combined previously, and far-and-away the best fuel economy in the segment. You could save hundreds of dollars every year on gas by going with the hybrid, but you'd obviously be sacrificing quite a bit of power in the process. What more can I read about the 2020 Toyota Highlander? The Highlander's chief engineer answers our questions about its size, how it's different from the RAV4, and why there isn't an Adventure trim level. We review all the changes for the 2020 Highlander, comparing it to its predecessor's dimensions, specs and interior design. We also provide more in-depth information about its engineering and new features. What features are available and what's the Highlander's price? 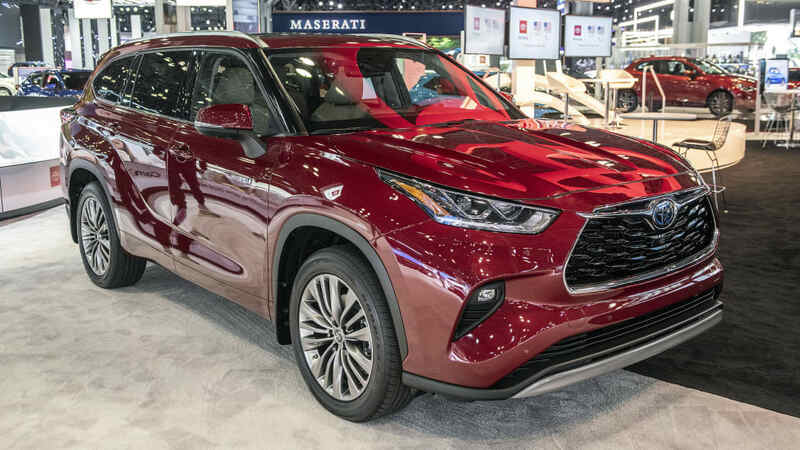 We expect pricing for the 2020 Highlander to be announced closer to its on-sale date in December 2019, with the Hybrid arriving in February 2020. Specifically, it should correspond with our first test drive opportunity, likely in November. We do have a pretty comprehensive features breakdown, however, which you can see below. Standard equipment on the Highlander L includes 18-inch alloy wheels, three-zone automatic climate control, accident avoidance tech features (see safety section below), full-speed adaptive cruise control, LED headlights, rear privacy glass, proximity entry and push-button start, an eight-way power driver seat and the 8-inch touchscreen. The LE additions include a power liftgate, blind-spot warning, LED foglamps, and a leather-wrapped steering wheel. The Platinum additions include adaptive and self-leveling headlights, automatic wipers, a panoramic sunroof bird's-eye parking camera, a head-up display, a digital rearview mirror camera, perforated leather upholstery, heated second-row seats and a 12.3-inch touchscreen. The 2020 Highlander Hybrid is offered in all the above trim levels except the L. What's Highlander's safety equipment? Every 2020 Highlander comes standard with forward collision warning with pedestrian detection and automatic emergency braking, lane-keeping assist, lane-tracing assist, road sign identification and alert, and automatic high beams. Blind-spot and rear cross-traffic warning are standard on all but the base trim level.